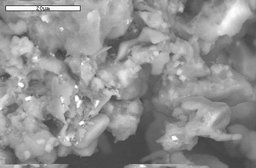 SEM image of black corrosion residue from EY56, Western Borehole. Photo by Spilde, Northup, and Boston. EDS spectrum of black corrosion residue from EY56, Western Borehole. Note presence of manganese peak. Samples are Au-Pd coated. Analysis by Spilde, Northup, and Boston. 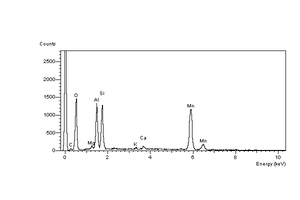 EDS spectrum of black corrosion residue from EY56, Western Borehole. Note presence of rare earth elements associated with phosphorus. Samples are Au-Pd coated. Analysis by Spilde, Northup, and Boston. 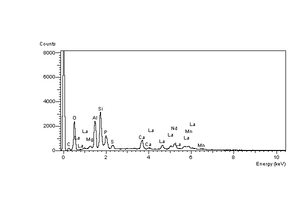 EDS spectrum of black corrosion residue from EY56, Western Borehole. Note presence of strong manganese peak. Samples are Au-Pd coated. Analysis by Spilde, Northup, and Boston. 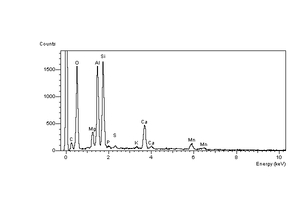 EDS spectrum of black corrosion residue from EY56, Western Borehole. Note presence of strong manganese peak and minor sulfur and magnesium peaks. Samples are Au-Pd coated. Analysis by Spilde, Northup, and Boston. 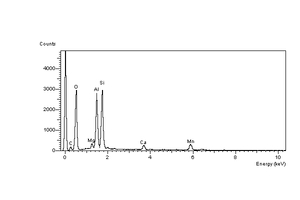 EDS spectrum of black corrosion residue from EY56, Western Borehole. 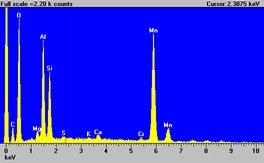 Note presence of manganese, sulfur, and magnesium peaks. Samples are Au-Pd coated. Analysis by Spilde, Northup, and Boston.